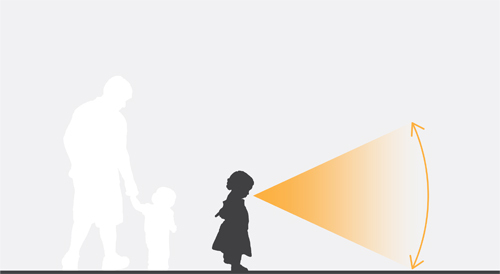 AEC - Architecture of Early Childhood: Architect David Businelli strives to "pay attention to the visual horizon of the child"
1. What are the things you have learnt from designing for young children (as opposed for adults)? I’ve learned that as a designer, I have to pay special attention to the visual horizon of children. That realization triggered memories of when I was a kid, constantly looking up at adult sized – everything-counters, desks, etc. That lower visual horizon has meaning and relevance to kids, and facilities designed for them must deal with it. Shapes, color and texture can be designed to be suitable for both the younger children and the adults that occupy the space. Fun colors and right sized cubbys, tables and chairs are not enough. 2. What do you believe to be the key architectural features that help to nurture and support children's wellbeing and development? Key architectural features are distinct site lines at child height, clear circulation through the space, design elements that capture a child’s imagination and get’s them thinking, good natural light and superior indoor air quality. Anybody who remembers the old school buildings that they attended as kids will remember the lousy colors, bad light and uncomfortable conditions – stuffy, too hot or too cold. 3. 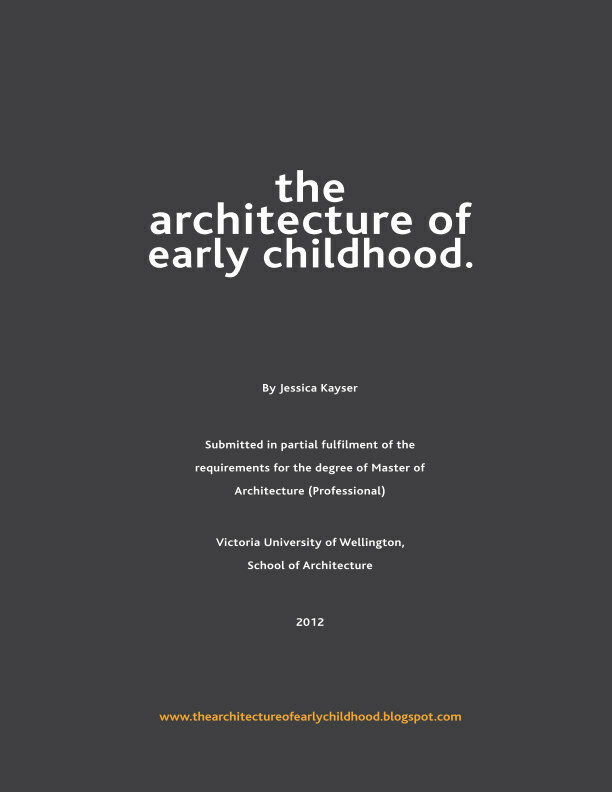 What are the biggest misgivings within the industry of early childhood and architecture, and how do you believe we can educate others to be more mindful in providing adequate architectural spaces for early childhood? I think that the biggest misgiving is that certain building elements should be skimped on, such as superior HVAC systems and good day lighting. School districts can tend to not understand why these things are important. If a facility for young children is going to serve them for a long period of time – say 25-50 years, why not build a superior building? It will ultimately perform better over the long term and give the kids maximum benefit. Also, they are not just small adults, so why just throw some colors on the wall and floor and maybe have a nicely shaped ceiling if the rest of the space is adult sized? The St Clare's Parish Center sets out to question the role that architecture plays in structuring a learning environment. Instead of vertical walls, the concept of "activating" all surfaces is applied, to engage the child and facilitate the use of the center. The space is also designed to cater for the uses' scale, employing two horizons: one at 3'-6" for the (developing) youths and the other at normal head height for the adults (guardians). For more see earlier post. A transparent and clearly defined entrance to the facility combined with many interbal child-oriented details designed to engage and inspire the children makes for a truly child-centred design. FasTracKids is a programme for children 6 months to 8 years of age, which aims to encourage children to learn by providing a fun and interactive setting utilising technology. Studio 16's brief was to build a single classroom, a waiting/presentation area with a plasma TV and reception area. The architects made the most of the rather small space, creating a fun free-standing curved classroom wall. Parts of the structure are revealed to teach the children about how the components are constructed, while the ceiling utilises pexiglass panels, making use of both the natural light from the clerestory windows and artificial light. Scale is considered with a child-friendly horizon of 3' - 6" to create a sense of intimacy and confidence in the young children. Waiting Area/Reception. 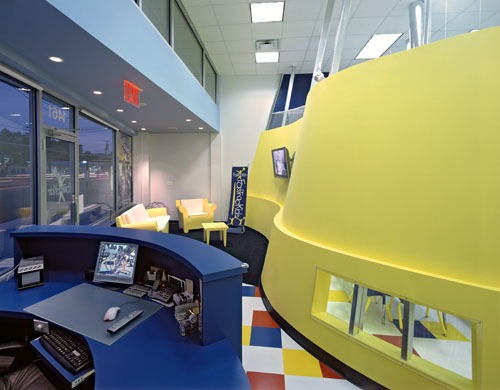 The curved desk and wall promotes movement and play. Reception and circulation space into the classroom.